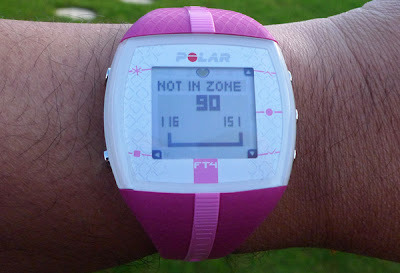 About a year ago I reviewed the Polar FT1 – a very basic heart rate monitor for anyone taking their first step into monitoring their fitness and performance. As its name suggests, the FT4 that I’m reviewing today sits a couple of rungs up from the FT1, though it would still suit anyone looking for their first heart rate monitor. The feature set is fairly basic on the FT4, but that’s not a bad thing for a fitness technology novice. More advanced devices like Polar’s FT80 or the RS800CX could prove very daunting, with so many features and so much data to analyse. It’s also worth remembering that if you primarily exercise in a gym environment, many of the advanced features seen in other devices – GPS tracking, bicycle sensors, speed and distance logging etc. – simply aren’t necessary. Don’t expect too many goodies when you open up the box. Inside you’ll find the FT4 itself, which is available in four colours – silver, bronze, orange and pink. 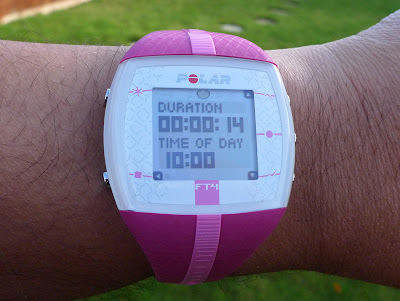 Since it was Sandra who originally requested the review sample, Polar was kind enough to send a pink model – like all women, Sandra’s a sucker for anything pink you know 🙂 But since I decided to write the review in the end, I got to wear a bright pink watch to the gym for a while! Colour aside, the FT4 is a far better looking device than the FT1. 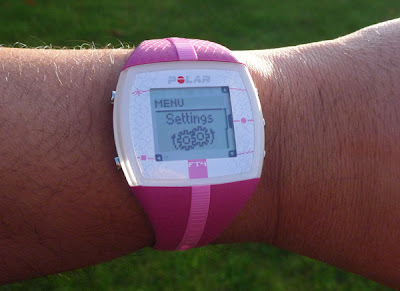 It’s smaller, sits more flush to your wrist and has a higher resolution screen. In fact, I’d argue that the orange version is one of the better-looking sports watches I’ve seen. The heart rate sensor strap that ships with the FT4 is an all-fabric affair, unlike the lower-spec, plastic example seen with the FT1. The sensor itself clips onto the fabric strap, making it easy to wash the strap after use. The all fabric heart rate sensor strap is far more comfortable than the old school plastic option that ships with the FT1. It’s also far easier to adjust to your chest size, and just generally easy to put on and take off. The sensor that clips to the strap is a WearLink+ model, which uses a coded signal to avoid interference from other devices. This is particularly useful if you plan on using your heart rate monitor in a gym where there could be many other people using similar devices. The WearLink+ sensor isn’t as advanced as Polar’s 2.4GHz WIND models, which ship with higher end devices. However, the standard WearLink+ sensor is compatible with the majority of gym based cardio equipment, which means that you’ll be able to see your heart rate displayed on the treadmill, cross-trainer or whatever you might be using. The FT4 itself is equipped with the same five-button layout as the FT80. The three buttons on the right edge handle most of the action. Pressing the top or bottom buttons on the right will take you into the menu screens and cycle through the options. The middle right button will select the current option. The bottom left button will take you back a menu level, eventually returning you to the time-of-day screen. The top left button activates the backlight, which is always handy if you’re out running at night. Pressing the middle right button from the ToD screen will tell the FT4 to sync with the WearLink+ heart rate sensor. Once that link is established, your heart rate will be displayed, and pressing the centre button once more will start the stopwatch and commence your training session. 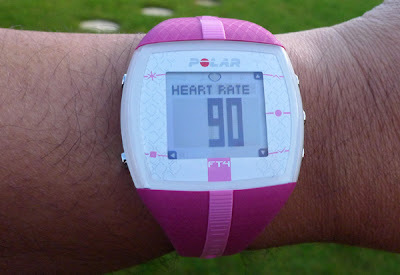 During a training session the top and bottom buttons on the right will scroll through various information screens – current heart rate, exercise time, calories burned etc. Meanwhile, pressing the bottom left button will pause the exercise session, while pressing it a second time will finish the session. 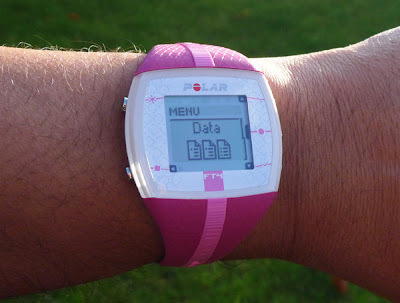 Before you get started you’ll need to input the usual personal data – age, weight etc. Using this data, the FT4 will automatically create training zones, designed to make your exercise sessions as efficient as possible. You can override these automatic training zones by creating your own zones, assuming you know your body better than the FT4. The FT4 will give you visual and audible warnings if you stray out of your predetermined training zones. These warnings are never much use to me, since I tend to train with earphones in, and don’t spend the whole session staring at my watch. The best solution is a vibration alert when you stray out of your zones, but to be fair, that’s not the kind of feature you’ll ever find on an entry-level device like the FT4. You can store 10 exercise sessions on the FT4, which is a big improvement over the one session memory seen in the FT1. That said, there’s no way to transfer that data to your computer – the FT4 isn’t compatible with Polar’s WINDLink or FlowLink systems. Again, that’s not a big surprise, but bear in mind you’ll have to manually enter your data into a spreadsheet if you want to track your progress over time. 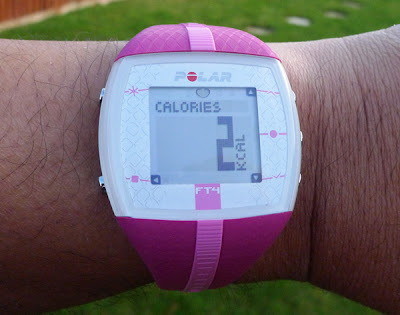 The Polar FT4 carries a recommended retail price tag of £74.50, but it can be found online for around £55 from a number of reputable retailers. At that price it’s a tempting prospect for anyone looking to start monitoring their fitness. The watch itself is well designed and sits nicely on the wrist, the all-fabric sensor strap is comfortable and the WearLink+ sensor is compatible with most cardio equipment you’ll find in your local gym. The feature set is far from extensive, but at least the fact that the watch can store 10 exercise sessions means that you don’t need to remember to write down results after every workout. If you like to look coordinated in the gym, the choice of colours is also a tangible benefit – I’d choose the orange! 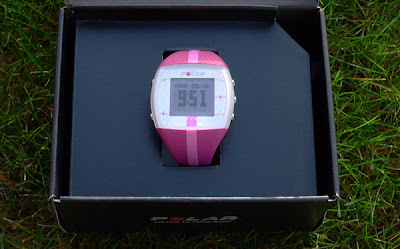 If you’re looking to buy your first heart rate monitor, the FT4 makes a very good case for itself. It’s far more usable and better equipped and featured than the cheaper FT1, making it worth a little extra cash. And at around £55, even if you decide you need something more advanced in 12-months time, the FT4 will still have been a sound investment.